One of the cool things about working at Microsoft is the constant stream of interesting guest speakers. Recently it was Steve Wozniak. It was facinating to listen to him speak about his love for technology. I had my trusty MacBook Pro and took down some notes and fun quotes. Posted in apple, MacBU, perspective. I love that he could “build anything for free.” I can picture him asking friends for spare parts, cobbling a circuit together ragtag over weeks when he could have bought something instead. Cool. That’s the spirit that seems to drive innovation and success, that never-say-quit thing (and lots of patience). Coupled with his sense of play and joy of tech, it’s no wonder he did what he did. Thanks for sharing David! In his book iWoz, Woz doesn’t seem to harbor any overt ill will toward Steve Jobs, although he does seem to be a little miffed that Steve took all of the credit for his work. His mentality seems to be that they both ended up very successful so there’s no sense in holding a grudge. 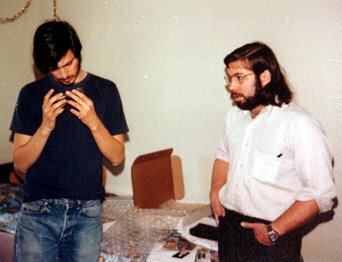 He does say that he and Steve are still friends, but I sense that there is a little bit of tension between them still despite Woz still almost idolizing Jobs. I don’t know Jobs, but I’ve had a few meals with Woz. He doesn’t seem bitter about Apple either when we’ve talked about it or in his writings on his website, Woz.org.He does believe that Jobs has been strongly affected in a negative way with the power and success at Apple–losing himself along the way is the sense I get. I believe that they are not good friends anymore, but also not at odds–somewhere in the middle.I have never heard him say anything negative about Apple except for one thread, which is to make the MacOS more rock solid. But I take this as a kind of “required perfection” that I have often heard from developers. As far as I know he LOVES almost all products of Apple especially the notebooks and his iPods. Also he thinks turning the company towards Intel was a good idea. And he attends the macworld keynotes with a big smile in his face. No bitterness at all. I think he loves Apple. He might be a bit disconnected but that’s okay because of his historical role in the making of Apple. Apple today has little to do with that garage founding atmosphere. It is now a huge business competing for shareholder value. Still, innovation is at its heart and it remains the most people oriented approach to technology. I despise the Windows interface. It is driven by engineers deprived of any taste for ergonomy. Apple is so much closer to people.